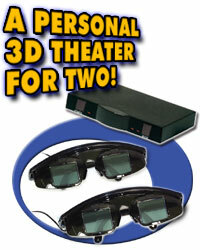 Experience incredible 3D effects! Step into your TV. The world opens up. The 3D action comes right off the screen and the effects surrounding you. The images are so real. Enjoy hours of great entertainment: Nature, Travel, Sports, Adventure, Horror and more! These only work on old style standard definition CRT TVs. The video transmitter and wired glasses easily connect between your CRT TV and VHS or DVD video player so you can view these and most other 3D videos and DVDs. Images take on a whole new dimension!. We also have extra pairs without the controller. Same as above but is a wireless system. (Includes 2 pr. wireless glasses, I/R Video Transmitter and all hardware). 9V battery required (not included). CRT or �Tube� type televisions are required for use with the 3D Video Viewing Systems. These types of televisions refresh their image in a very consistent manner, which makes it very easy for the 3D system to synchronize to the signal. HDTV, Plasma, LCD, and most projection television systems refresh their image in a random manner. This makes it impossible for the 3D Video Viewing system to synchronize to their signal, making them incompatible with the system. The exception to this is 3 �gun� CRT based projection systems where all 3 guns have a synchronized refresh.